Habarana Village by Cinnamon introduced a novel initiative of sustainable and resourceful farming in the drought-ridden region. Habarana Village by Cinnamon, also a popular tourist destination during the dry season due to the legendary elephant gathering in the bordering lake is introducing ‘aquaponics’ to the surrounding village community, a farming model that is fast being accepted globally as the ideal cultivation system for water scarcity. The newly introduced aquaponics farming model is a combination of aquaculture and hydroponics, which combines farming fish and growing plants using soil-less processes. The symbiotic relationship thrives because the nutrient-dense fish waste, similar to cow manure, flows through the plant nursery, acting as a natural fertilizer to successfully grow crops. The system also eliminates the use of pesticides and insecticides since it would kill the fish, thereby harvesting super clean, super pure produce. The resort heavily promotes environmentally-friendly practices and a village-way of life, co-existing with neighbouring villages where most of their fresh produce is currently purchased. This project aims to impress the significance of climatically adaptable farming practices upon the community, and most importantly the potential for multiple revenue streams; farming consumable fish along with the produce. A growing market demand for organic vegetables is also beneficial for farmers, with proven fast-growing cycles of aquaponics due to the high levels of nutrients the plants are able to absorb. 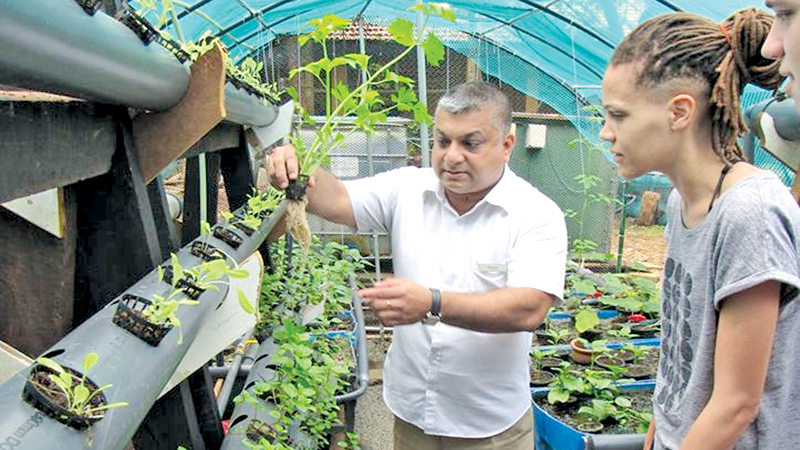 In terms of water requirement, research shows that aquaponics uses up to 90 per cent less water than traditional methods due to the recirculating system. “Commercial aquaponics is the food production system of the future. We plan to create awareness of this innovative system among our neighbouring communities, the local Farmers Association as well as other groups and stakeholders, and especially among school children, to help them understand the advantages of aquaponics, so that they can benefit from this sustainable and profitable farming model,” Habarana Village, General Manager, Marlon Robert said.